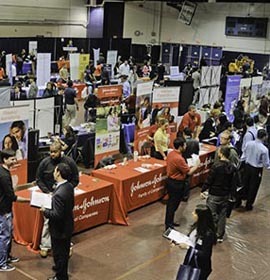 Preparing for a job fair can seem like a daunting task. There can be an overwhelming amount of information to process, so we are here to help you find the focus of your job search and hopefully you can approach the event with confidence! Proper preparation is critical for any aspect of the job hunt, including job fairs, which are a great and effective way to build connections with employers. So we have helped by providing you with 5 easy steps to prep and get the most out of your job fair experience. 5. Be patient and stay positive! There are also a few things to keep in mind once you have arrived at the end. First and foremost, remember to approach an employer with confidence. Introduce yourself and ask questions about their company before diving into questions about the opportunities available. 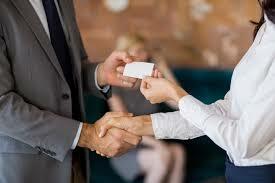 Collect business cards for employers you connect with, and if you have your own offer one to them. This gives you a way to contact them for further follow up after the event has concluded. Exchanging business cards and following up is especially important as it helps you transition from only a connection, to building a relationship with the organization. Want to put these tips to their use? Check out the on-campus events that are approaching quickly! Jobs on Campus Job Fair is happening January 25th, 2018 in Guernsey Market, and Grad Send Off on February 6th, 2018 in the Ian Beddis Gym. Can't make it to those events? Check out the events calendar on careerzone.brocku.ca to find more coming up soon!